There are some amazing animated films that have been gracing our film benches over the past few months. 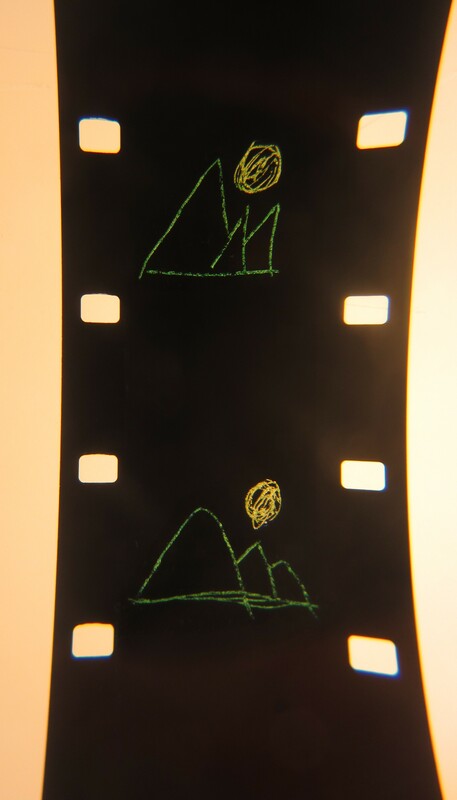 Some favorites we’ve inspected include Sleeping Beauty (1934) by Russian filmmaker Alexander Alexeieff, inventor of pinscreen animation, Perpetual Motion (1992) and a beautiful scratch film (pictured above) both from the Karen Aqua Collection. We especially enjoyed inspecting a print of Adventures of an * (1957), a moving short that depicts the life cycle of a man from childhood to adulthood, and utilizes a brilliant jazz score to offset the images. You can explore the holdings in our Animation Collection on the HFA website and through the Harvard Library Catalog, HOLLIS+. This entry was posted in animation, Archives, children's films, Karen Aqua on January 8, 2016 by conservator3.